The Diplomatic Choir of Berlin presents a “Konzert ohne Grenzen”. on April 19th, a dream comes true! 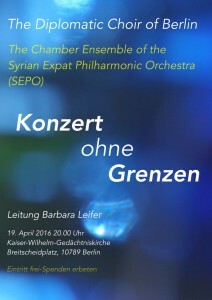 We are participating with The Chamber Ensemble of the Syrian Expat Philharmonic Orchestra (SEPO). 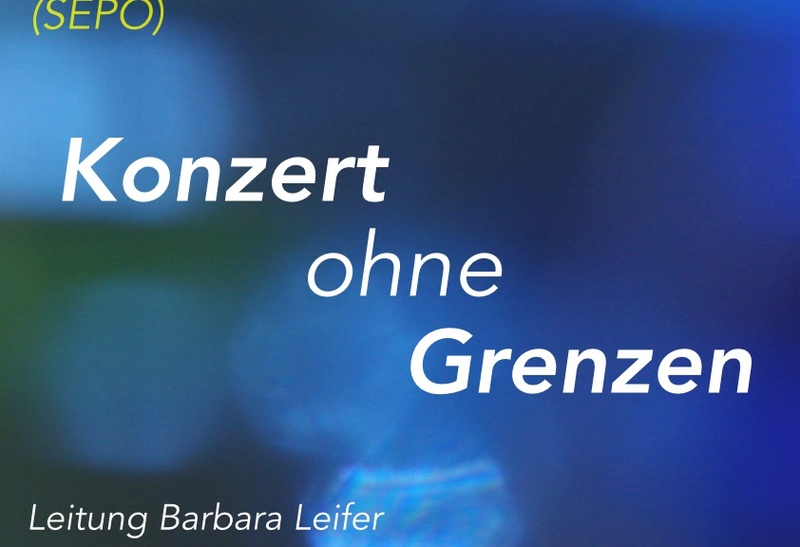 We are joining together and presenting a “KONZERT ohne GRENZEN.” Please come and join us!! Konzert ohne Grenzen – The Diplomatic Choir of Berlin. I heard of your fantastic project yesterday in the radio. Too late to drive to far away Berlin. My wife is an enthusiastic singer too, and I would like to present her a visit of one of your concerts. Are there further concerts planned in 2016 or 2017, possibly again with SEPO? Dear Mr. Schoenberger, our choir is finally doing the Christian, Islamic/Arabic, and Jewish program with musicians from ‘the world’. We are all working together in a foreign territory. The process is also the goal. It will be at the Berliner Dom on April 26th, 2018. Please write us at diplochoirberlin@gmail.com. Dear Mr. Schoenberger, excuse the late reply. Thanks so much on your enthusiasm of our projects. Please keep in touch with us and check our website and we will post our future concerts. We are planning a large Messiah in the spring and you and your wife are most welcome!